Last week we discussed living by yourself. Living by yourself often means doing things around the house by yourself. Now, when I say “things around the house”, I mean cleaning, cooking, laundry, grocery shopping and stuff like that. And these tasks are often called “household chores”. 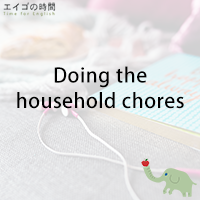 When you make a sentence about carrying out these tasks, you can use the verb “do” for almost all household chores. For example, you can say “you do the dishes”, instead of saying “you wash the dishes”. Likewise, you do the laundry. You do the ironing. You do the bathroom, which means “cleaning the bathroom”. You do the floors. You do the garden. You do the groceries. Collectively, you do the household chores. I’ll do the cooking, you’ll do the dishes. Next Post 砂糖の代わりに蜂蜜 – You can use honey instead of sugar.